We are one step closer to our general aim. 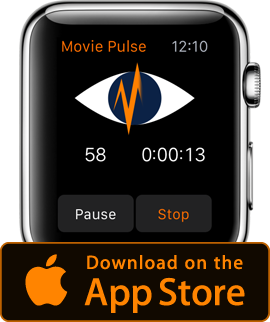 For identifying structures within movies we analyze the heart rate of the viewers with our Movie Pulse app. Because of a generous support we’re now able to record up to 5 viewers in parallel! For a first start with multiple Apple Watches we’ve had four volunteers watching “Citizen Kane”. All Watches are paired to a single iPhone 5 and committed their data without any hassle. The data shows no gaps, missing periods of recording. Only a small exception of being perfect: one record stopped prior the end of the movie. Perhaps the user inadvertently pressed the stop-button. Therefore the last 13 minutes are not having the base of 4 recordings and are less significant. Having watched “Citizen Kane” is an important requirement in terms of understanding the history of cinema. That motion pictures are able to condense what went wrong in an entire single life with a single ordinary object – this really strikes me every time I see this movie. I don’t want to go into details here. “Rosebud” is all I have to cite. If we now have a look onto the raw data of our Movie Pulse volunteers – my first reaction has probably been the same than yours: Am I on the right track? For heaven’s sake, how could this mess matter in any meaning? They all must have seen another movie or the whole Movie Pulse enchilada is for the birds. Wait. The data needed some nurture. We need to have a look at each recording individually. Each person has his/her own resting heart rate. We don’t know this rate, but we can calculate the overall average for the movie records of this person. This figure along with the minimum and maximum pulse in this period of time is the starting point of all our computations. In the Movie Pulse app there is a far more sophisticated algorithm which computes not only the overall average, but the average changing within a specific time frame. This gives the nice up and down trend line. Having here the plain average will be sufficient for now. The same data vertical aligned at their average. Note the absence of absolute figures of the heart rate. The colors have been altered to a warm tone for female, cold for male test users. What formerly has been the average will now serve as the base – zero null. The numbers of units from average to the lowest will represent the minimum range of units the person has reached. The maximum units are defined the same way above zero. Instead of having a heart rate, we deal with a range of units at a base of zero – the threshold of maximum and minimum our test person has reached at a particular time within the movie. A first attempt is to identify the amount of difference at each recording time. Let’s say at time 0:32:12 person 1 has a value of 4, person 2 a value of 6, person 3 a value of 7 and person 4 a value of minus 4. Three people are above their individual average and one person is below it. The deviation is 4,43…. somehow complicated, therefore computers come in very handy. Two more simple examples: p1 value 1, p2 value 1, p3 value 1 and p4 value 2 will have a deviation of 0,5. Yes 1,1,1,1 will gain 0,0 – no difference at all. Low deviation will mean great conformity – which, in our analysis, is the biggest proof of having viewers responding similar. Determining the deviation compares the data and will give a guidance: low deviation means users reacted more similar. To make this graph more readable I added a simple TRUE value for those recordings which have a small deviation (average or below), which is represented by the darker gray. This is a first hint for periods of time which have gained equal reactions. But there is one problem: How about the differences the test users have in terms of range of threshold? Of course, according to my theory, a very high or low value will state either high attention or intense state of being calm. But this is the peak we might come closer soon; for now it’s more elementary and useful at which moments the viewers responded in the same way, the same direction! The simple overall average of all records is depicted in grey. The red line shows the period of time all four users had have data within the similar area: either above or below their own zero base. I came to the conclusion that having an overall average of all four users might not sufficient and will alter the data in a wrong way: Imagine one person reacting completely different. With pure math average his or her data will be taken into account nevertheless it might be completely different than the majority. This is what we’re after: majority. The resulting graph shows data where the majority (three out of four, 75%) has had similar data, either above (red) or below (green) the zero base. 100 % similarity is shown in black. For this reason I computed the graph depicting the average raise or descent of A) all four test persons B) of the majority of 75% of the test persons which is shown in red and green. Therefore A) is a subset of B) and is marked in black on this image (white in the video). Again the movie is boiled down into 2 minutes excepts, placed beside each other; one row representing 30 minutes of the movie. Those 100% and 75% conformity results have been used in the “Citizen Kane in 2 minutes” movie. The overlay of green and red color is applied at the same rules as the prior published “Metropolis in 2 minutes”: high units above the average will tint the image in red, low units in green. This time the color is multiplied with the image, not overlayed. The video takes the average threshold of the majority (75%) into account – again the image becomes tinted in green and red. Additionally the 100% subset of all four test users has been included as well. To distinguish both data visually, a hint for the 100% subset has been added in white. If one image shows a white frame: this means all viewers have reacted the same way, not only the majority. The graph below the timeline shows this subset in white as well. Please remember that this first multiple recording unfortunately is not complete approx. 13 minutes prior the movie ended. So “n” has changed from four to three persons at 1:39:12. There is always room for improvement. Any sugestions are welcome too!